This is what happens when you are a foodie and you have a few hours in Montreal to kill before hopping on a plane. You end up at Jean-Talon Market. Trust me, I couldn’t think of a better way to spend time. 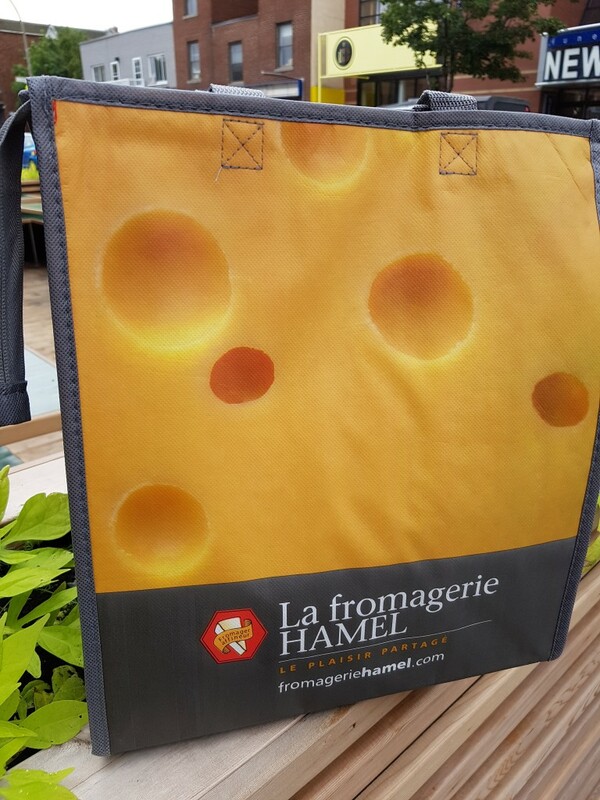 Naturally I bought so many goodies that I had to buy a bag! In case you are wondering “What did I buy? ” a better question might be “what didn’t I buy”. 1. Bourgot: I know they are ugly but they are my favourite item to buy at Jean-Talon Market. I discovered that they are also called Whelks and are very abundant in the St. Lawrence River and Estuary. 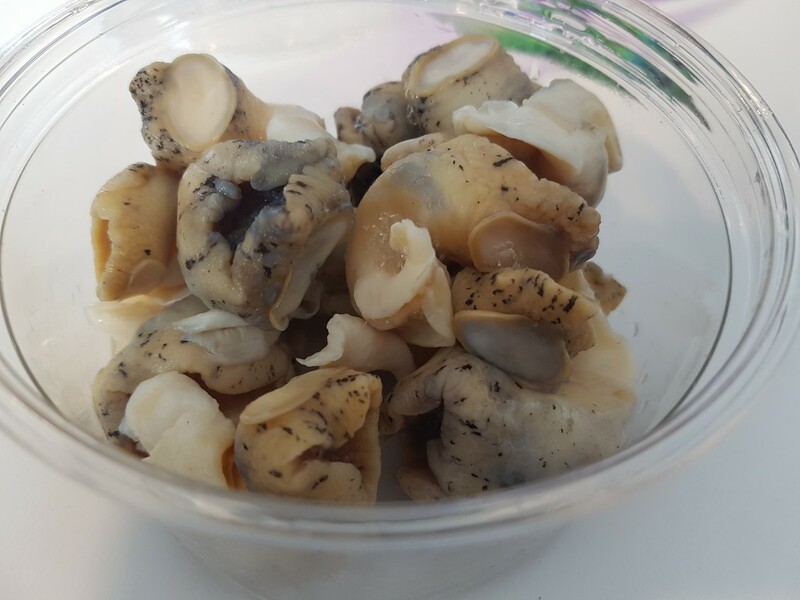 These Whelks are ready-to-eat as they are sold in brine, which gives them a long shelf life as well as a tender and flavourful taste. Sadly I had to throw the brine away at the airport but they still made it through security. 2. 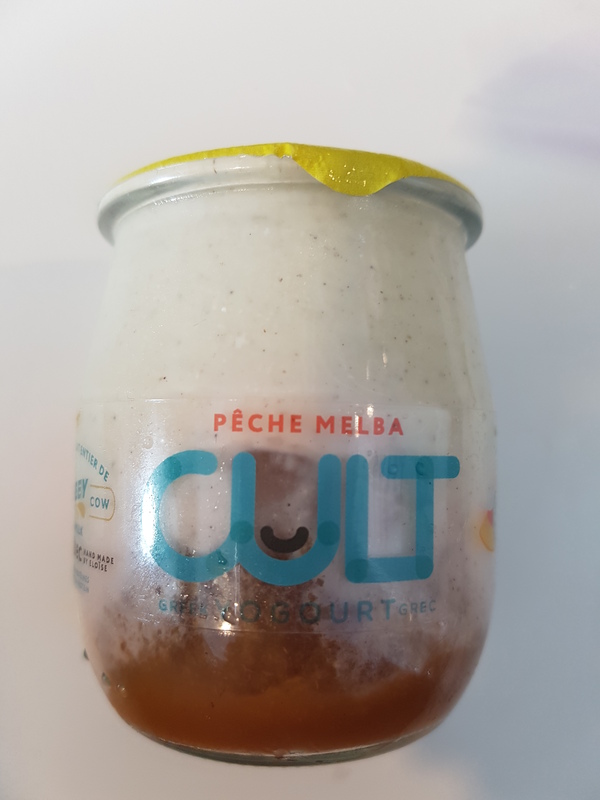 Cult Yogurt – I bought two but one was confiscated at security. Go figure. I discovered this yogurt back in May and hope to see it on the shelves in Toronto one day soon. It’s creamy creamy creamy. 3. 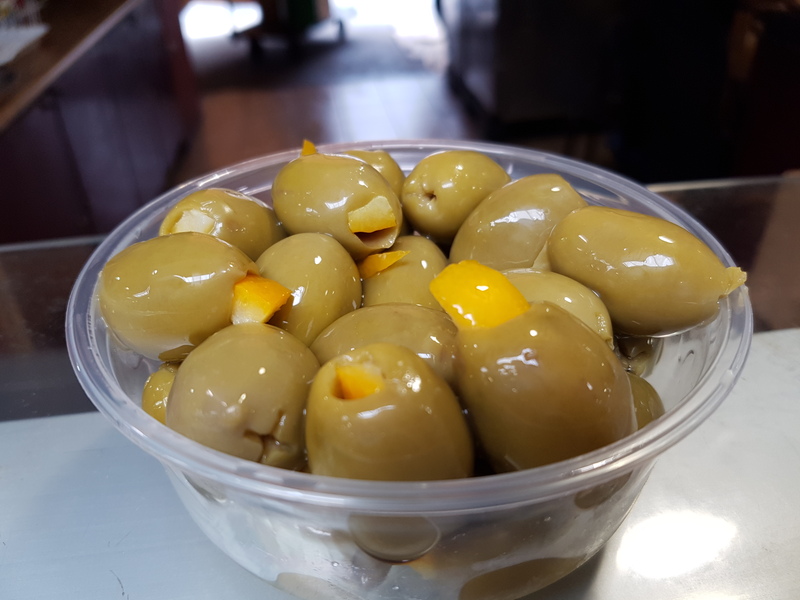 Olives stuffed with Orange Peel. Love this combo. 4. 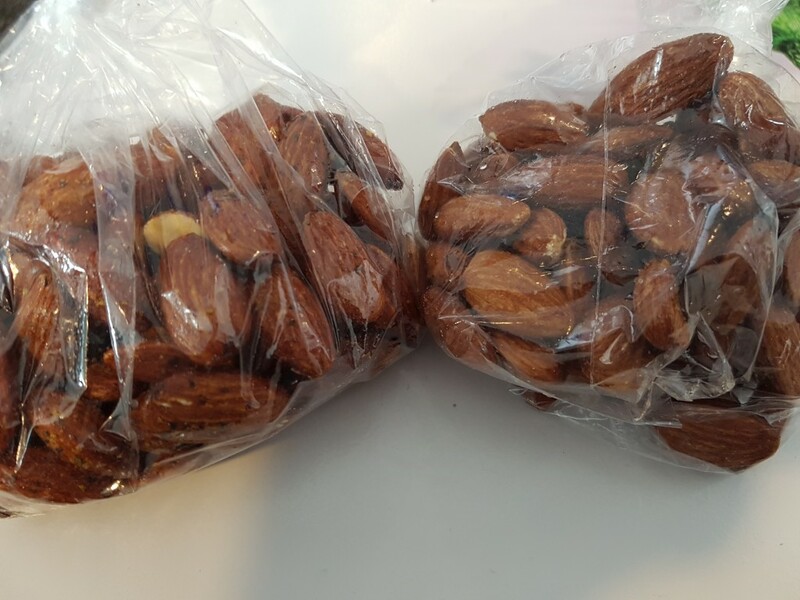 Nuts: One bag is Lemon/Pepper and the other back is smoked to perfection. 5. 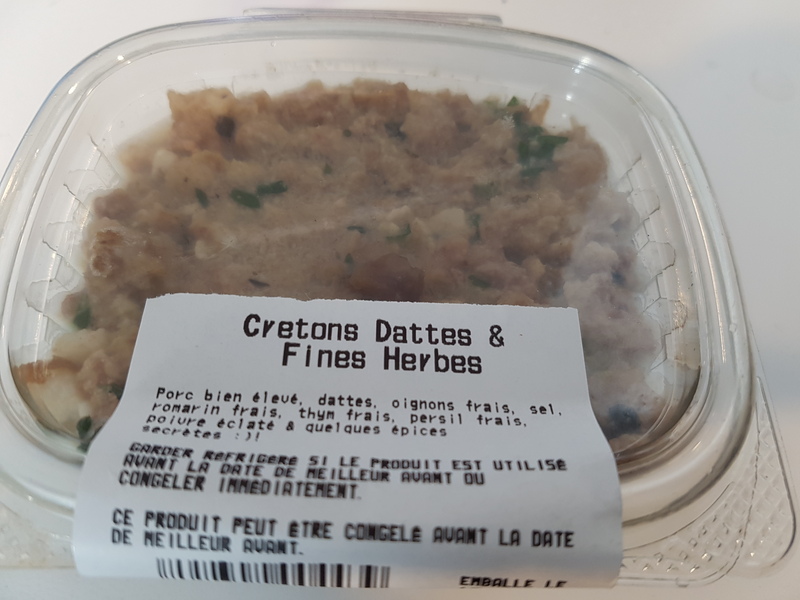 Cretons with Dates and Herbs: Not something you see in Toronto which is code for: “I had to buy it”. 6. 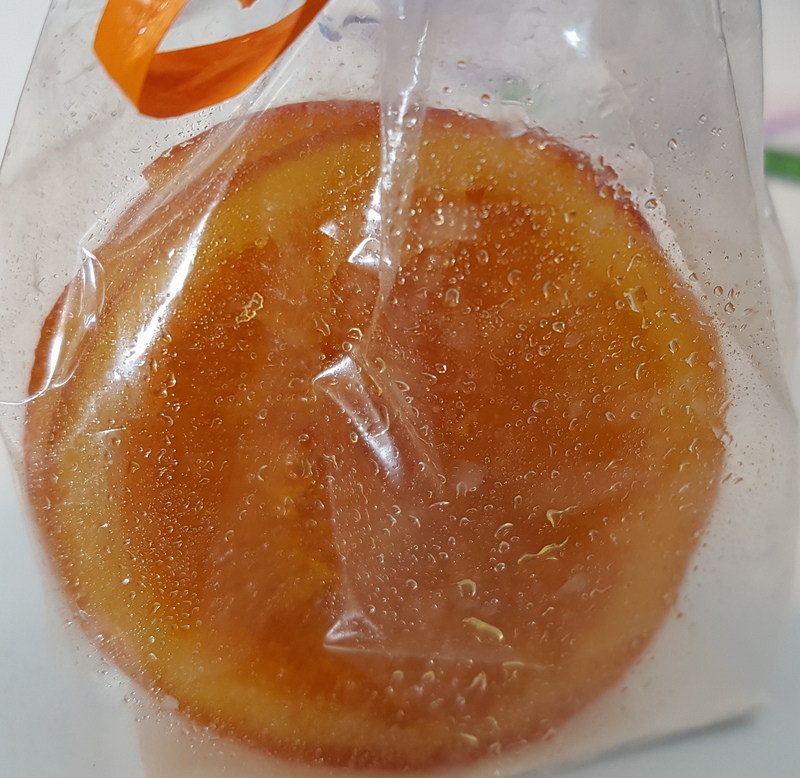 Candied Orange: I have no idea what I’m going to do with this but I’m sure it will be a lovely garnish for something! 7. 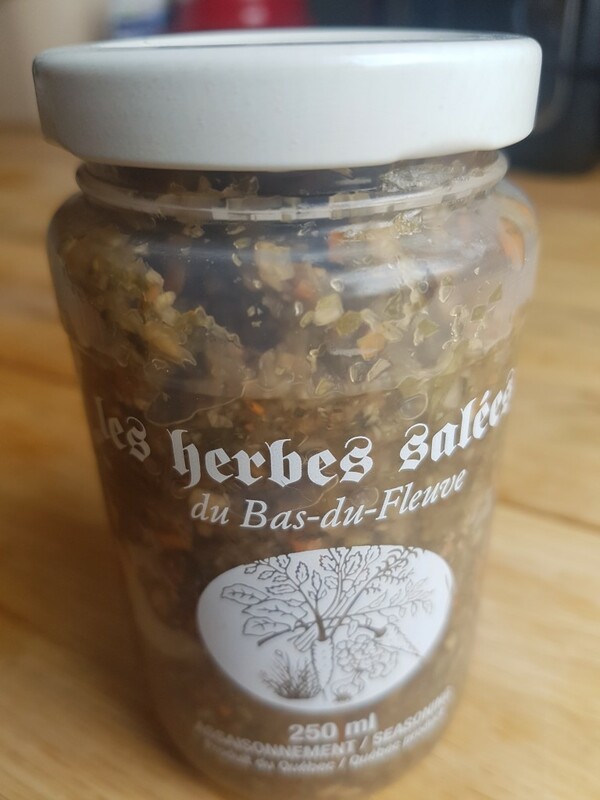 Salt with Herbs: I have a feeling I will be sprinkling this product on my eggs, in dressings, on fish etc. For $3.99 I figured it was a good buy! As always, I adore this market for so many reasons. 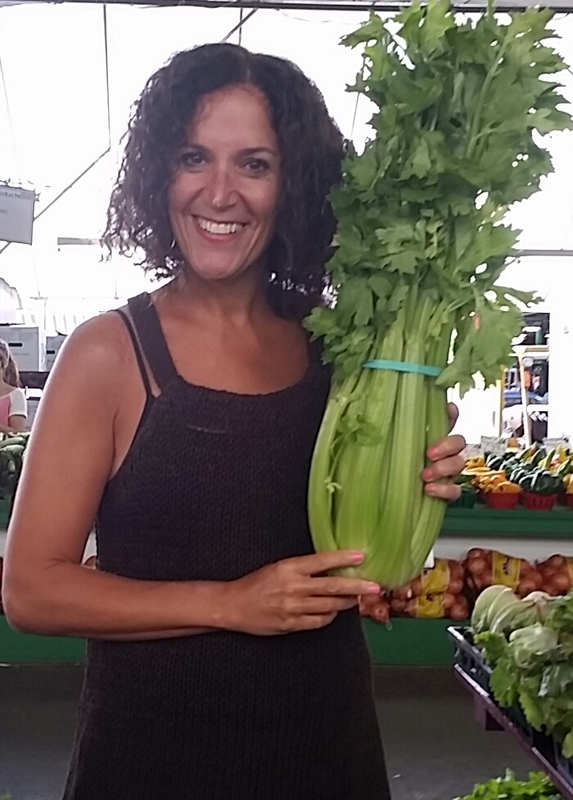 Hope you get a chance to visit Montreal in the near future and visit this market too! Then we continued to Jean-Talon Market (7070 Avenue Henri Julien). I absolutely adore this market. It’s one of my favourites for so many reasons. 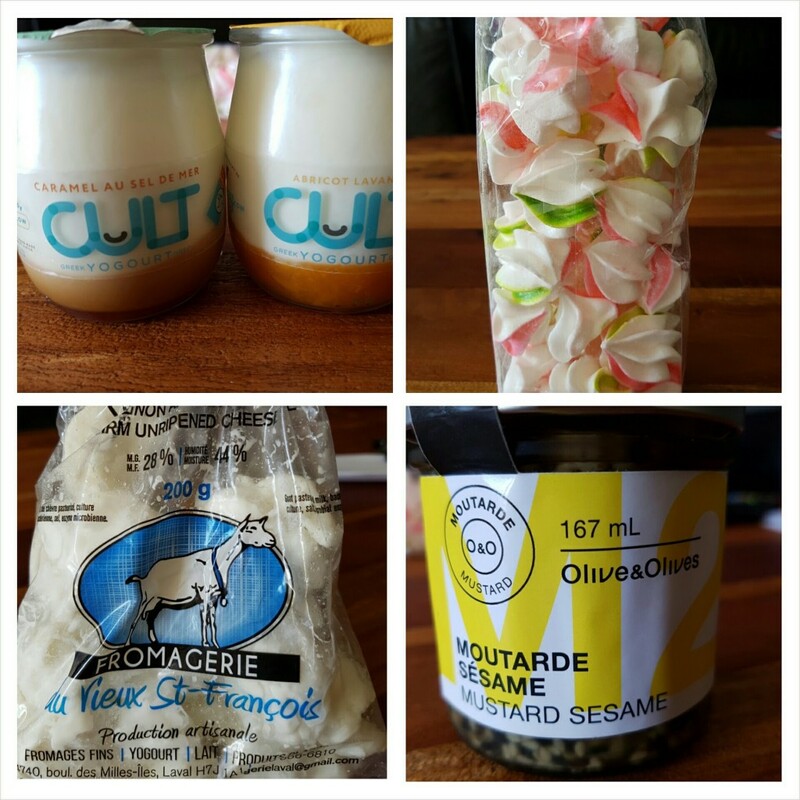 I bought a new yogurt I had never seen, (which I hope we will see in Toronto one day) a cheese I had never tasted (Tahlia) goat cheese curds and a gorgeous mustard with black sesame seeds. Sadly I found out that the butter I use to buy is no longer available. I use to buy this butter on every visit and was so sad to hear that they went out of business. Sniff. Then we went to the Montreal Biodome (4777 Avenue Pierre-Coubertin) to see something other than food!! 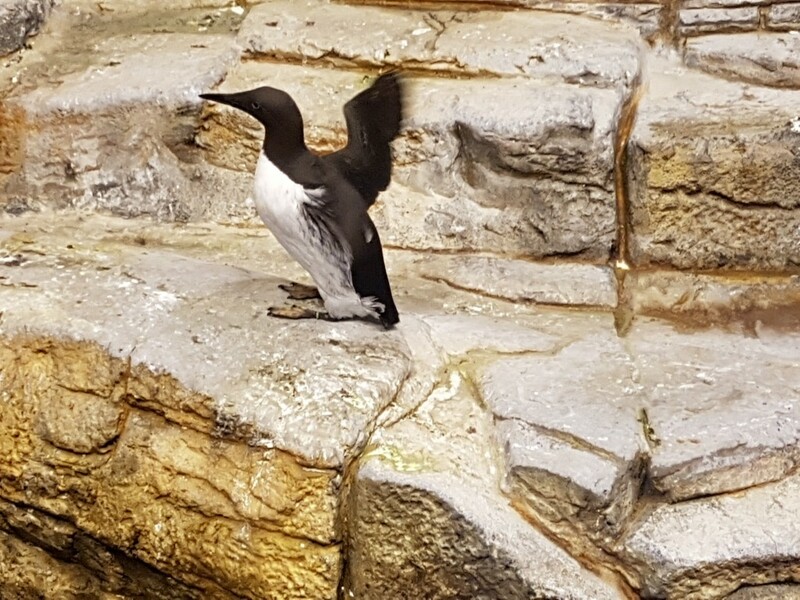 We encountered an oasis of beautiful birds, penguins and more. So glad we included this in our itinerary. This special space is accurately described as an indoor zoo, an aquarium and a botanical garden wrapped into one space! 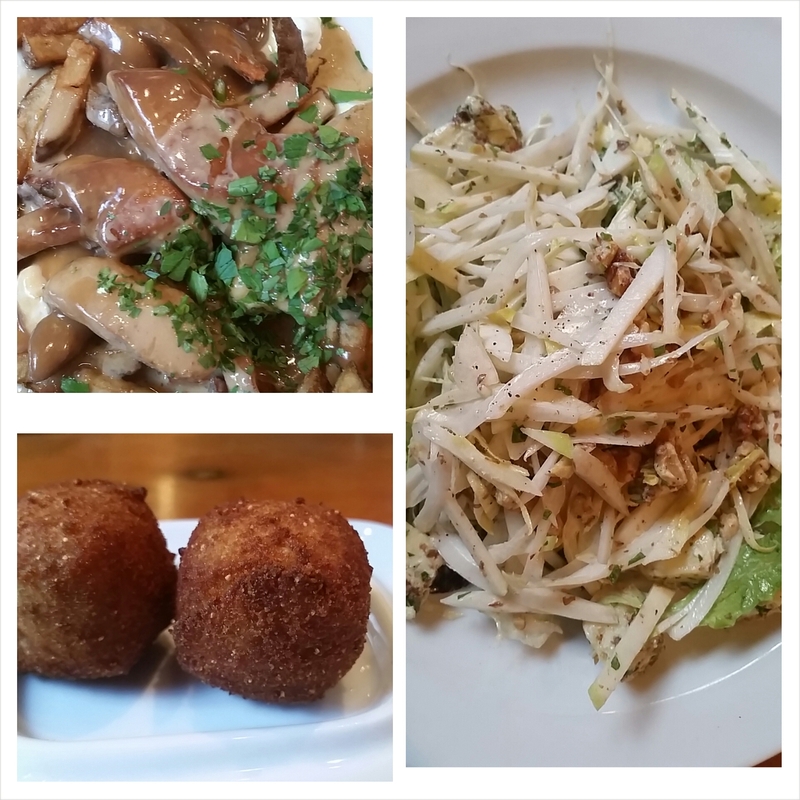 Naturally a trip to Montreal wouldn’t be complete without visiting Au Pied Du Cochon. (536 Avenue Duluth E). We couldn’t get reservations but showed up at 5 pm and scored a table on their outdoor patio. I already know what I’m ordering next time (I’m a planner – can you tell?) 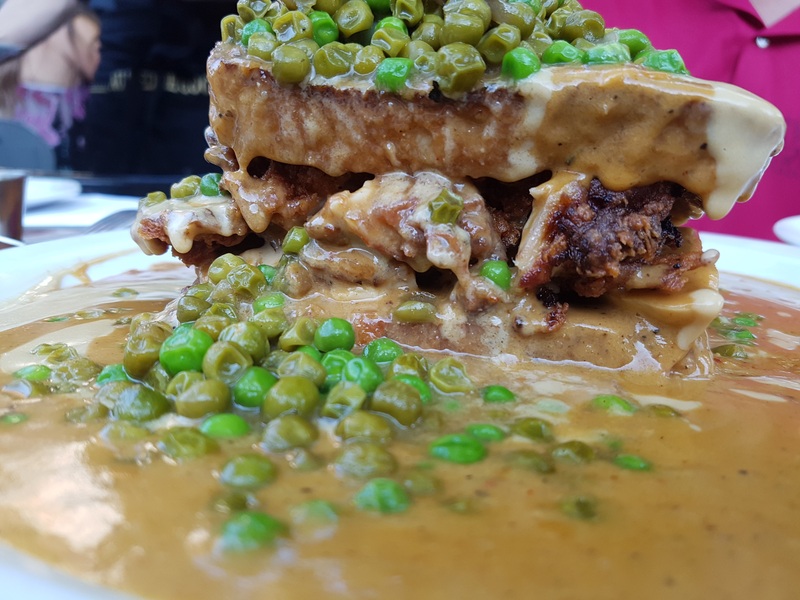 – this incredible looking hot chicken sandwich. 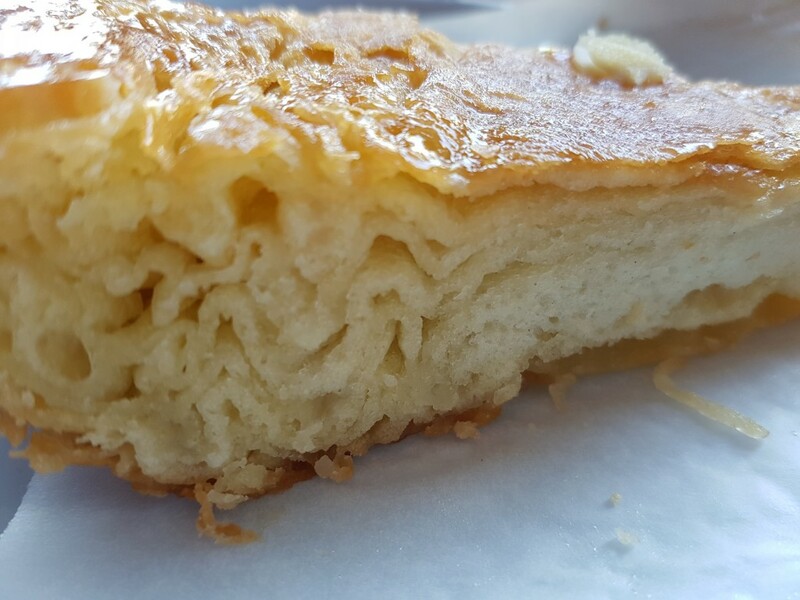 Woke up and headed directly to Patisserie Au Kouign Amann (322 Avenue du Mont-Royal E) for their incredible Kougin Amann which I was introduced to in 2012. (see blog post here). I’m almost grateful that I’ve never seen this pastry in Toronto! 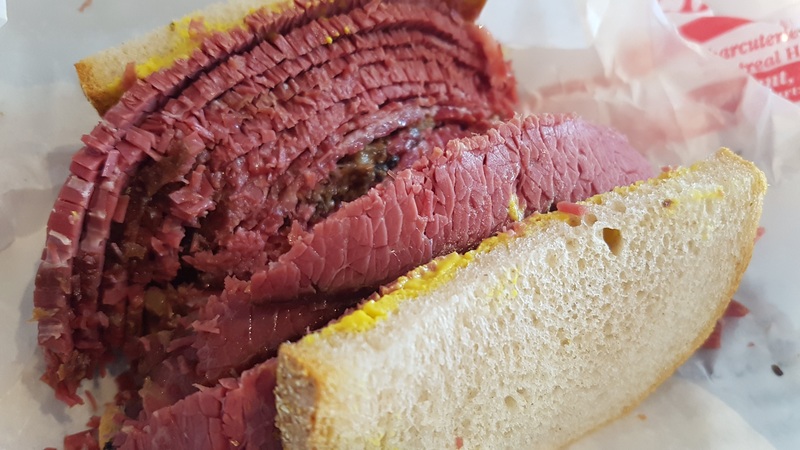 Again, a trip to Montreal would not be complete without a trip to Schwartz’s Deli (3895 Boul St-Laurent). The smoked meat sandwich I inhaled is the real deal. 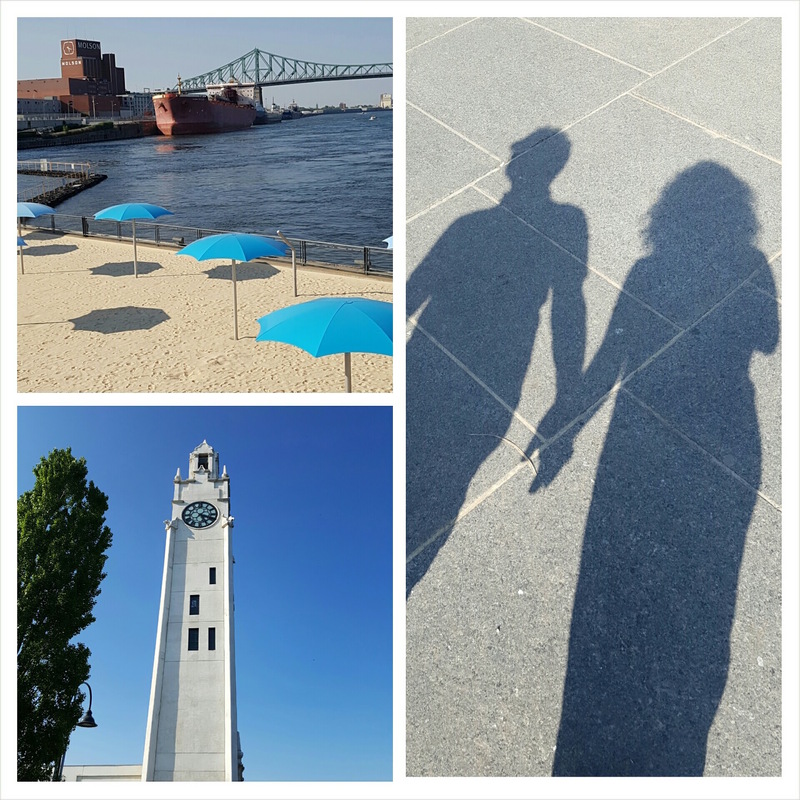 After lunch, we walked thru Old Montreal and the Port. 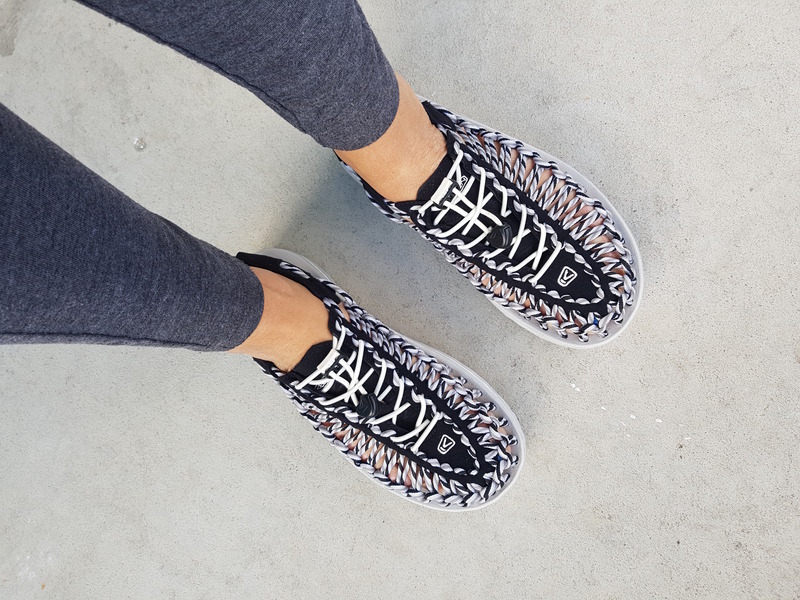 My new Keen shoes were a pleasure to wear as we walked and walked and walked. On both days we were wiped and never made it out of the hotel after 8 pm. Just. Too. Tired. Went for breakfast with a childhood friend at Maison Christian Faure. 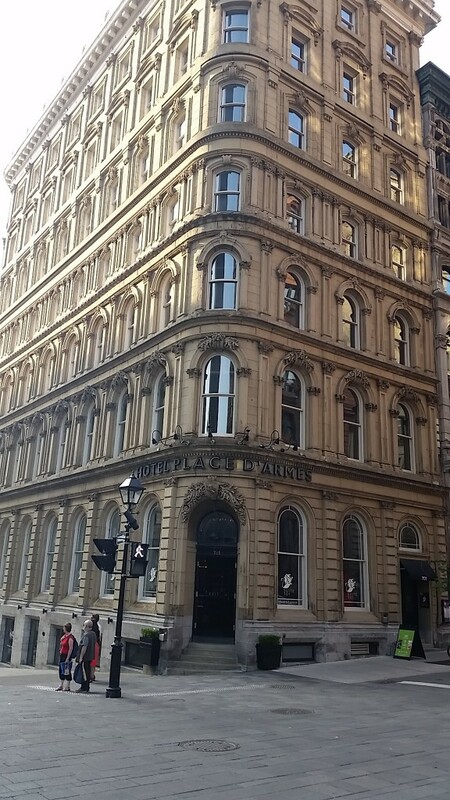 (355 Place Royale). 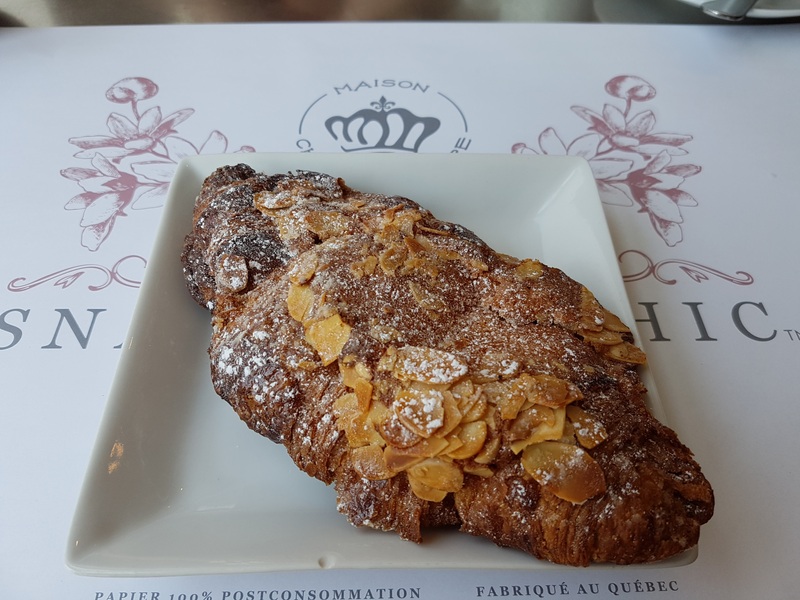 This almond croissant is something else and the best part is that they are coming to Toronto in September. Last stop before heading on to the highway was La Diperie. (68 Avenue De Pins E) OH MY. OH MY. OH MY. This soft serve ice cream shop has 30 different dips (turtle, cookie dough, milk banana, baileys, espresso, cheese cake etc) and a variety of toppings (pretzels, pistachios, almonds, coconut etc). 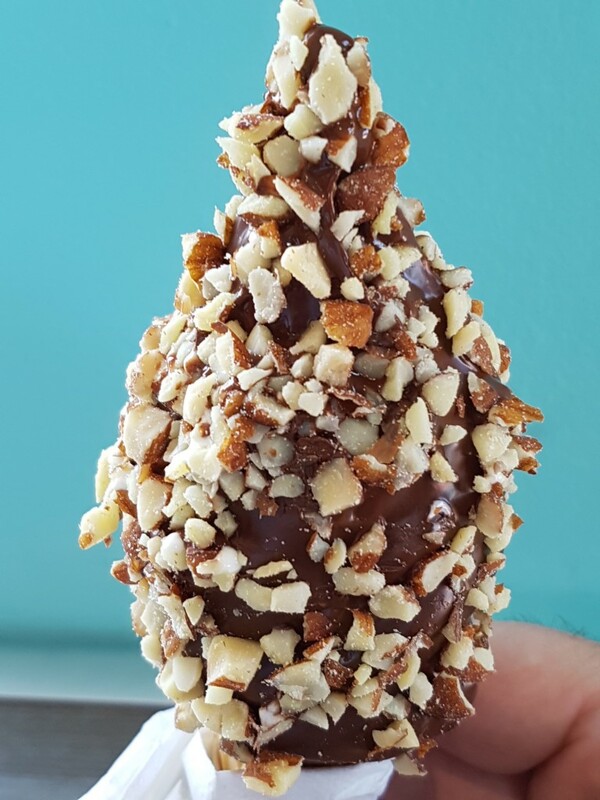 I decided to order Becky’s Fave from their menu – which was soft serve vanilla ice cream dipped into ginger dark chocolate and topped with pistachios. 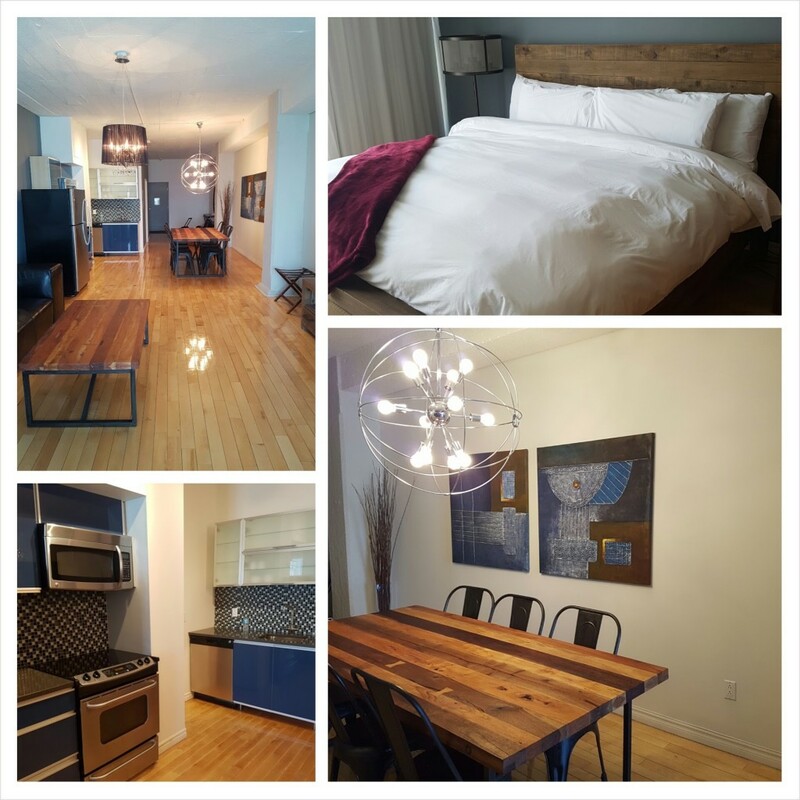 As for our hotel: We stayed at the beautiful Loft Hotel which was located at 338 Terrace St. Denis. Our room was just stunning and complete with a FULL kitchen i.e. dishwasher, pots and pans, etc etc. I couldn’t have been happier with the space and the location. Would stay there again in a heart beat. Hope you get a chance to visit Montreal one day soon! 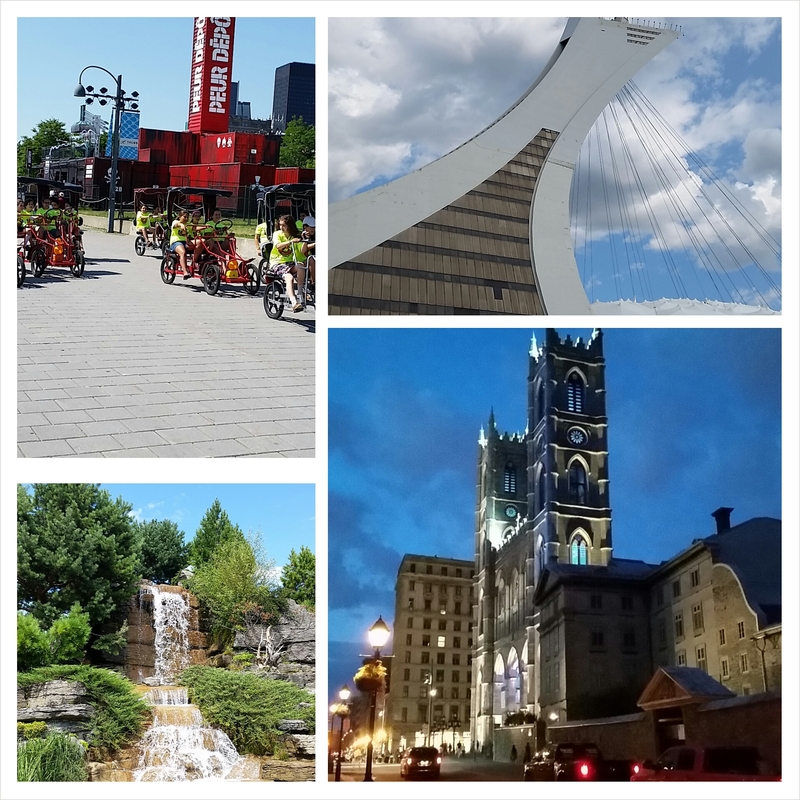 Please click here to find out more about Montreal attractions, festivals, events and more. I Was A Mermaid…For An Hour! 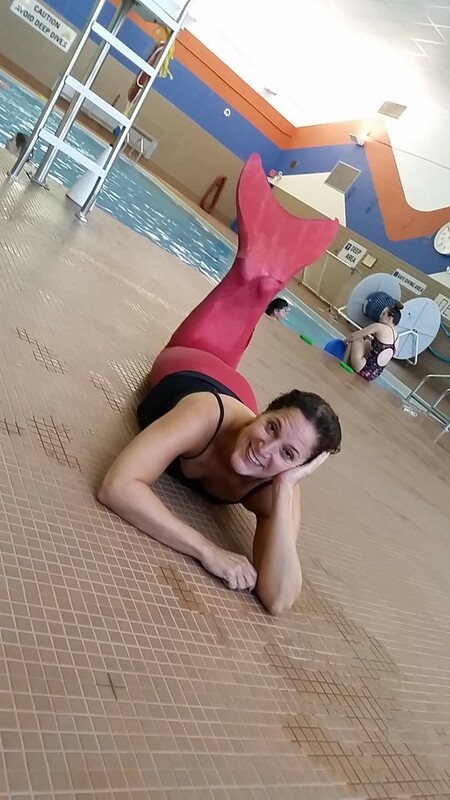 When I received an invitation from the founder of Aquamermaid to try a class, I immediately said “YES”. The class started off by picking out our “mermaid tails”. Then everyone introduced themselves with their real name, their mermaid name, and their favourite stretch. Following the introductions, we got into the water and everyone swam a length. 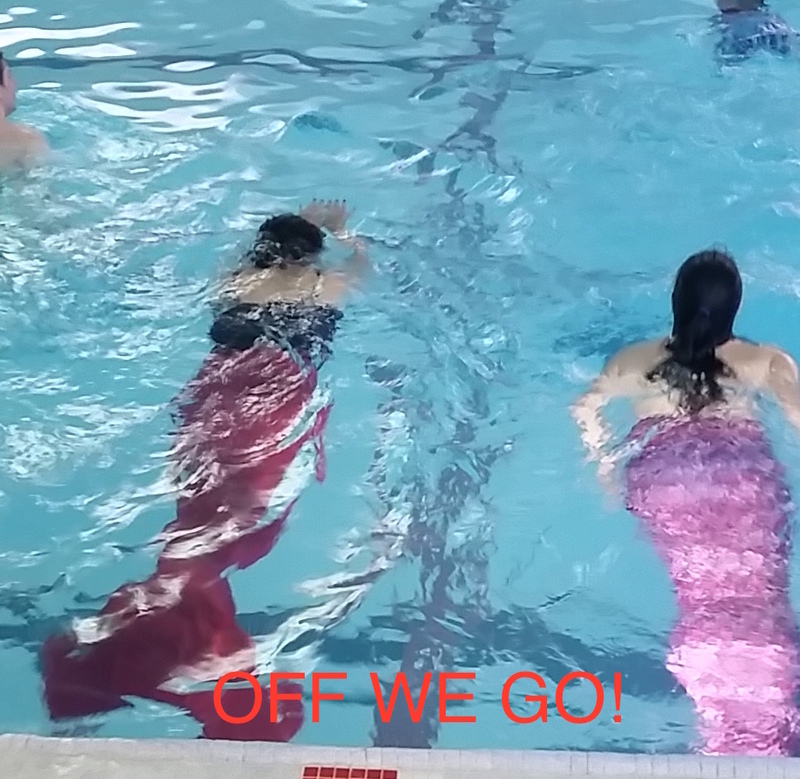 Then the fun started, as we wiggled into our our respective mermaid tails. We did some drills in the water – front, back, side. 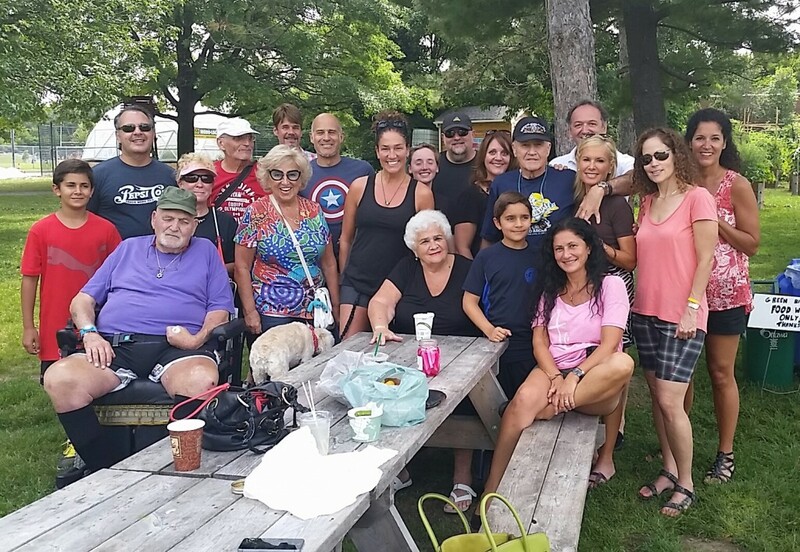 Trust me, everyone was smiling and having fun. 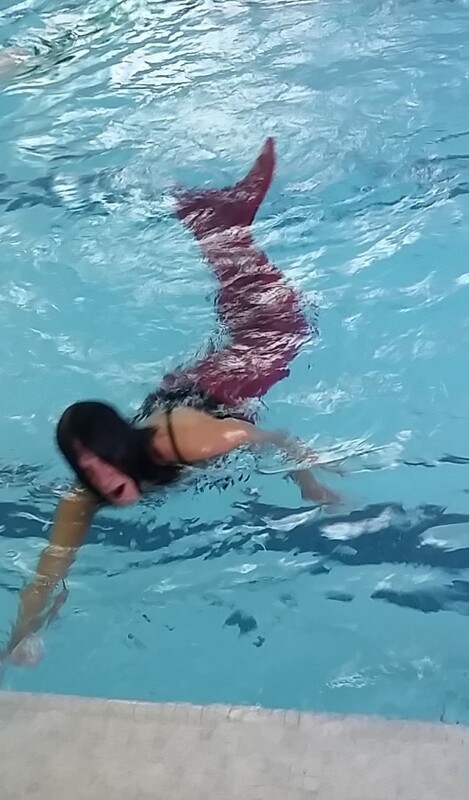 As you can see from this next photo, being a mermaid is harder than it looks! Then we got a chance to take more photos. LOL. -guys can participate and in fact there was a guy in our class. -this is a super fun party idea for kids AND adults. 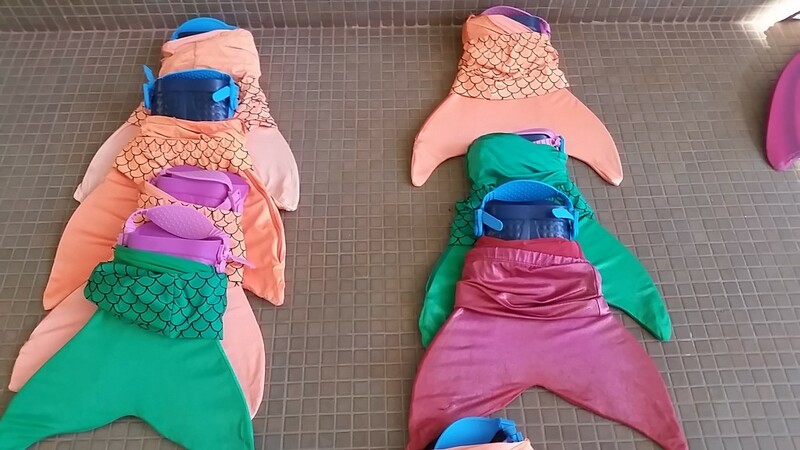 -you can actually buy the mermaid tail! 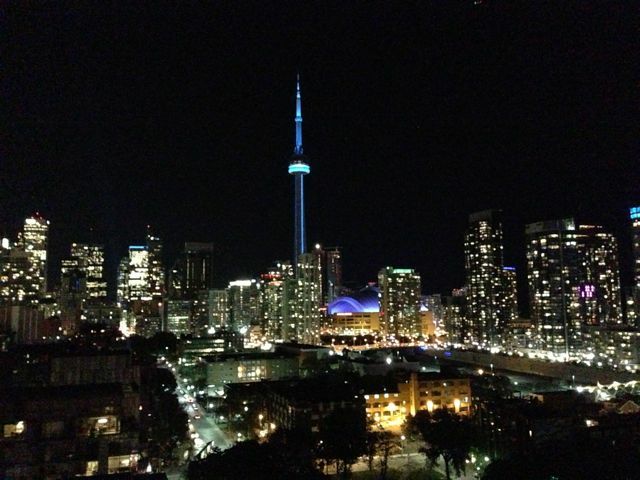 I was pretty lucky this summer and had the opportunity to spend 10 days in this beautiful city. I stayed at the lovely Hotel Place D’Armes. This charming hotel is brilliantly located in Old Montreal and just steps away from Notre-Dame Basilica. 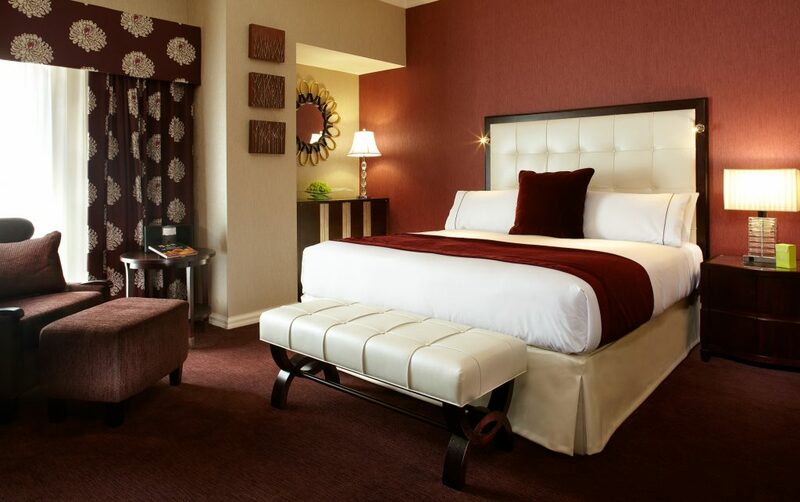 The hotel featured high ceilings, spacious rooms and a great team at their concierge desk! Not to mention a fantastic bar and a roof top patio! a) Jean Talon Market. I simply adore this market! 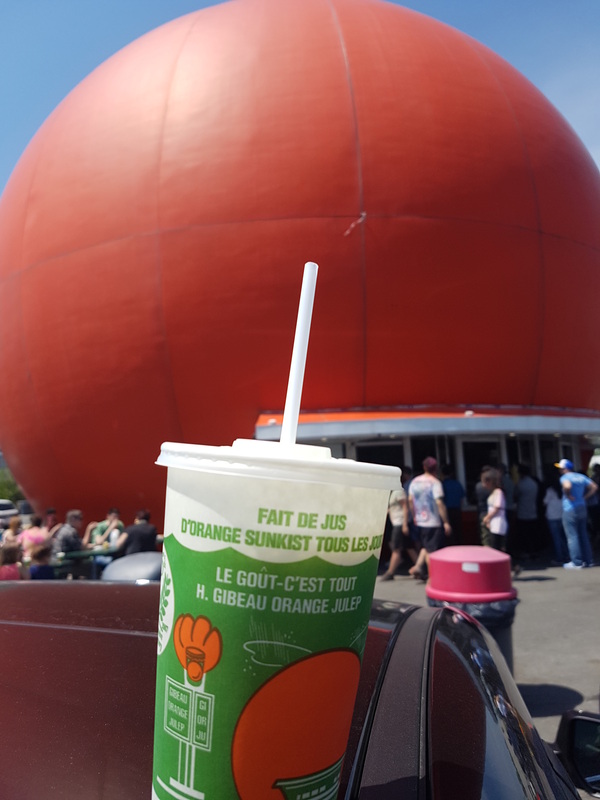 A trip to Montreal would not be complete without it. 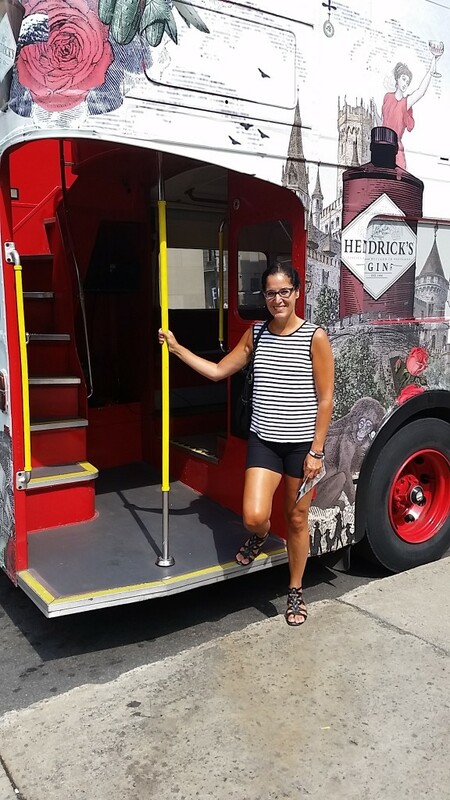 b) The Hop-on-Hop-Off Double Decker bus tour throughout Montreal, that is offered by Greyline. 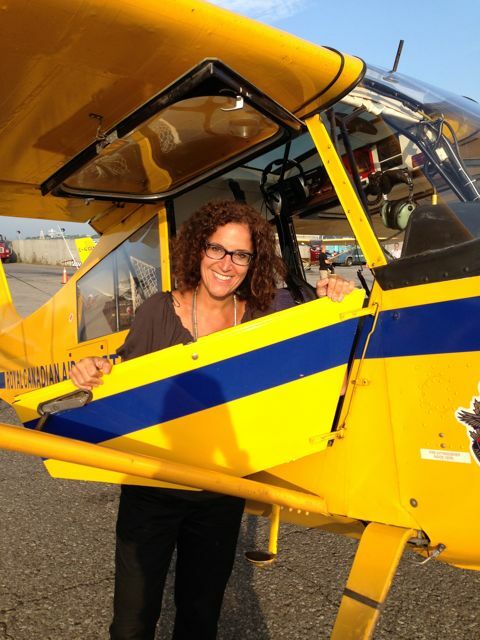 This is the best way to see a city and I’ve now done these tours in Ottawa, Barcelona and Montreal. c) I spent hours wandering thru the The Botanical Garden. It’s truly magical. Then I visited the The Planetarium and the Olympic Stadium. Sadly I didn’t go to the Biodome as I’d been a few years ago but regret not returning as they are all grouped together. Give yourself a whole day or break up these three attractions into two days! 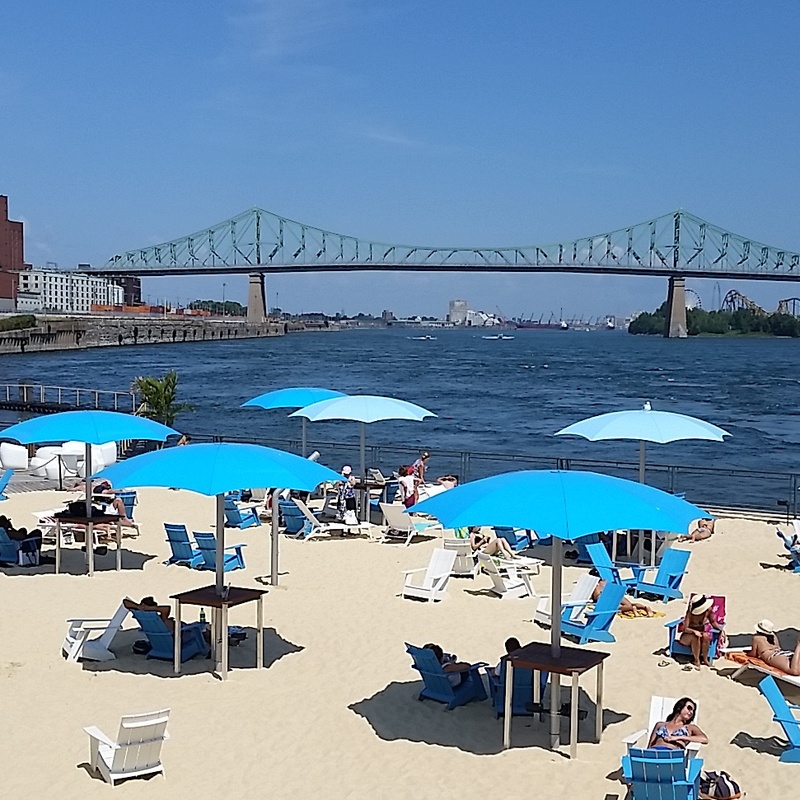 d) Discovered a beach in the port of Old Montreal – which was the perfect place to relax after a long day of touring. e) A trip to Simons Department store. Believe it or not – had never been to this store even though I’ve been visiting Montreal on a yearly basis since 1990. 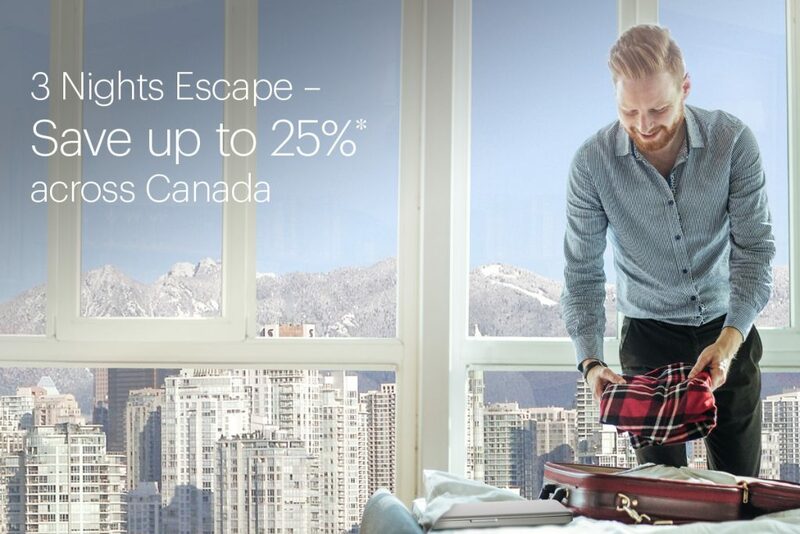 Montreal Tourism Office: Click here for special promotions, tourism info, etc. Here’s a list of restaurants that I tried. Sadly I didn’t make it to Joe Beef as they were closed. Sniff. Garde Manger: What did we order? 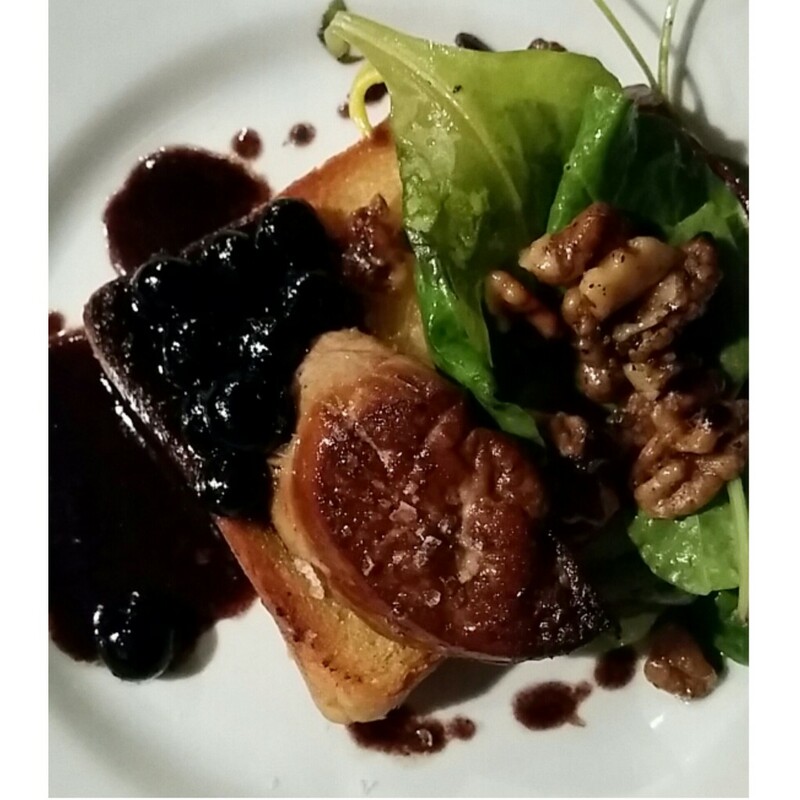 The lobster poutine, Foie Gras with brioche and a blueberry sauce, and the Walleye. 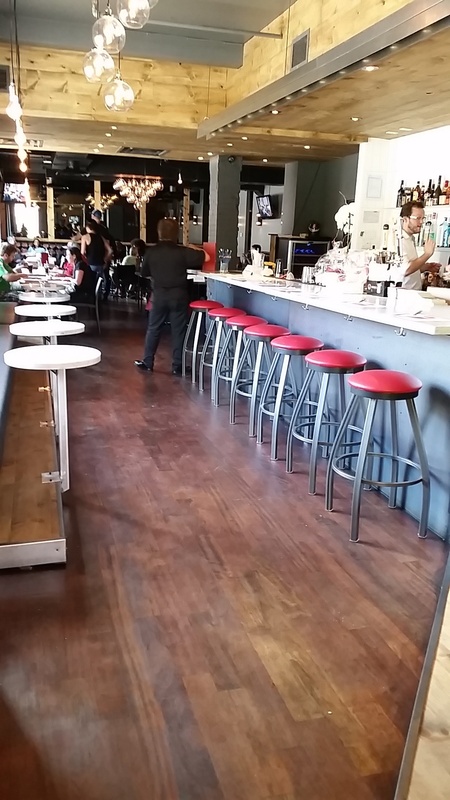 We sat at the bar in the back and loved both our food and the cool yet casual vibe of this restaurant. PS almost went back another night for the Foie Gras dish – it was that good. Au Pied Du Cochon; This is my 3rd time to this restaurant in the past 7 years and I keep ordering the same thing! Foie Gras Poutine and Cromesquis Foie Gras (basically deep fried squares and when you pop them into your mouth – foie gros oozes into your mouth). This visit I felt like I need to add some vegetables to balance the meal and it didn’t disappoint. 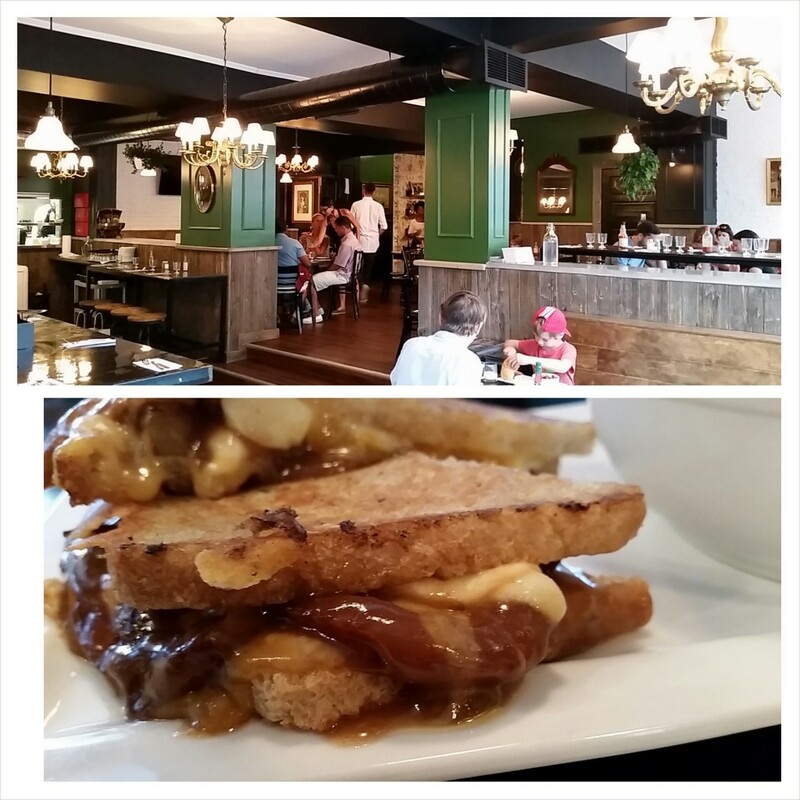 L’Gros Luxe: Noticed that they had a poutine sandwich on the menu AND deep fried avocado. Didn’t take me long to add L’Gros Luxe to the list of restaurants I wanted to check out. There’s a reason why they just opened their second location…great food, great prices and friendly staff. Olive & Gourmando: This restaurant seems to be packed ALL the time. I went an hour before closing and it was still full of customers (minus the line ups). It was a good strategy not to go for breakfast or lunch seeing as I’m not fond of line ups. The waitress told me that #24 on the menu is a popular salad so I ordered it. It was SO pretty and SO tasty. Just what I needed. I can see why this is a popular spot for tourists and for locals. 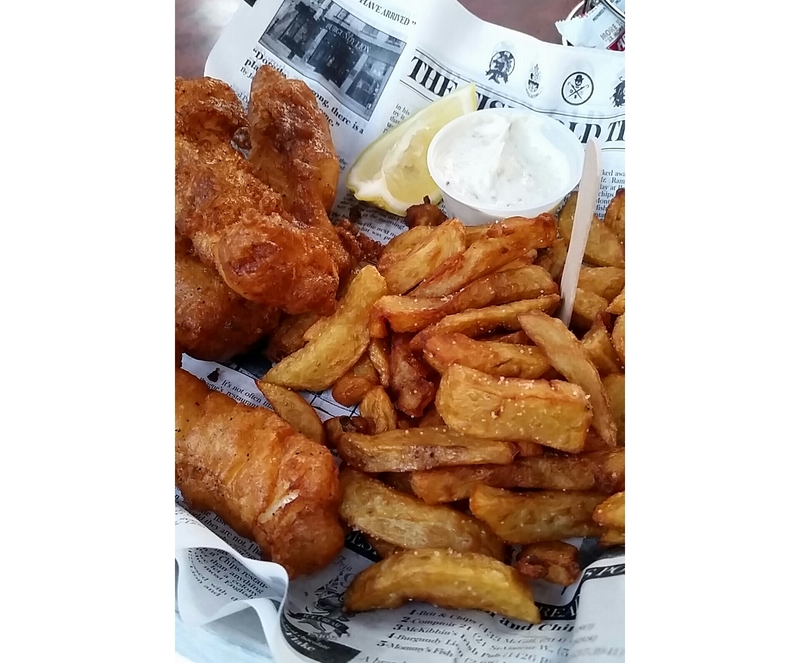 Brit & Chips; One night I was looking for a casual restaurant that wasn’t far from Old Montreal and this restaurant fit the bill. Just perfect. 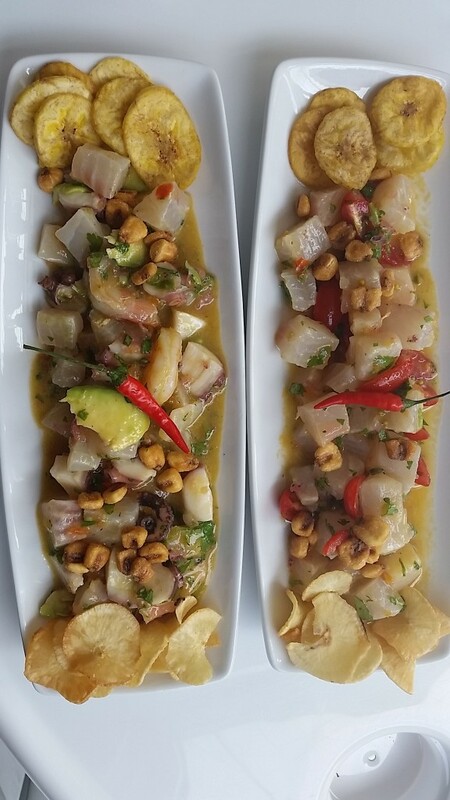 Ceviches: Oh what a treat to discover this restaurant. Love. Love. Love this restaurant. 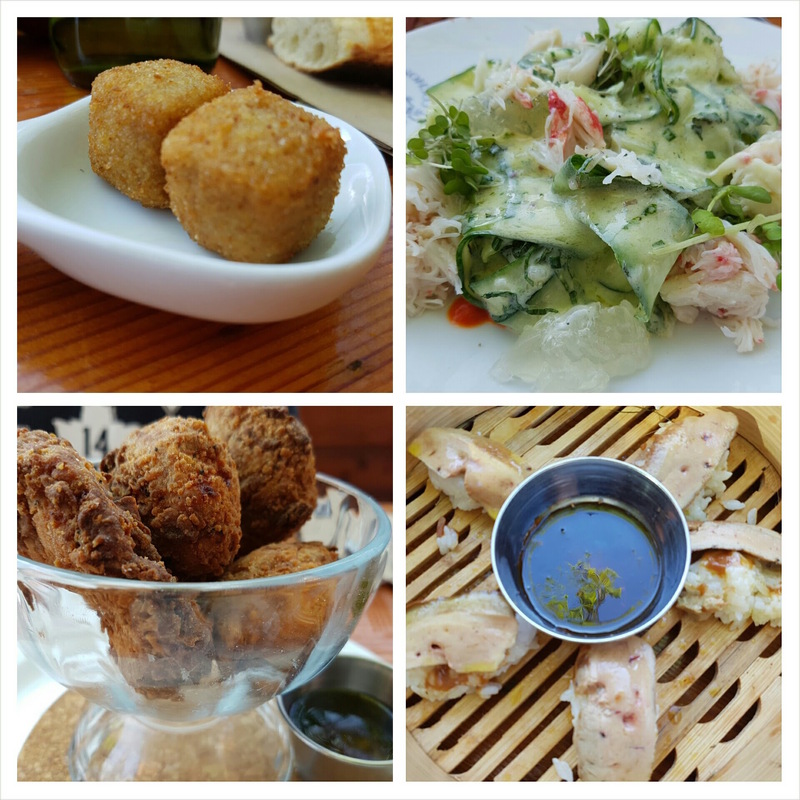 Again – another casual restaurant and exactly what I was looking for. I wish there was a restaurant like this in Toronto! 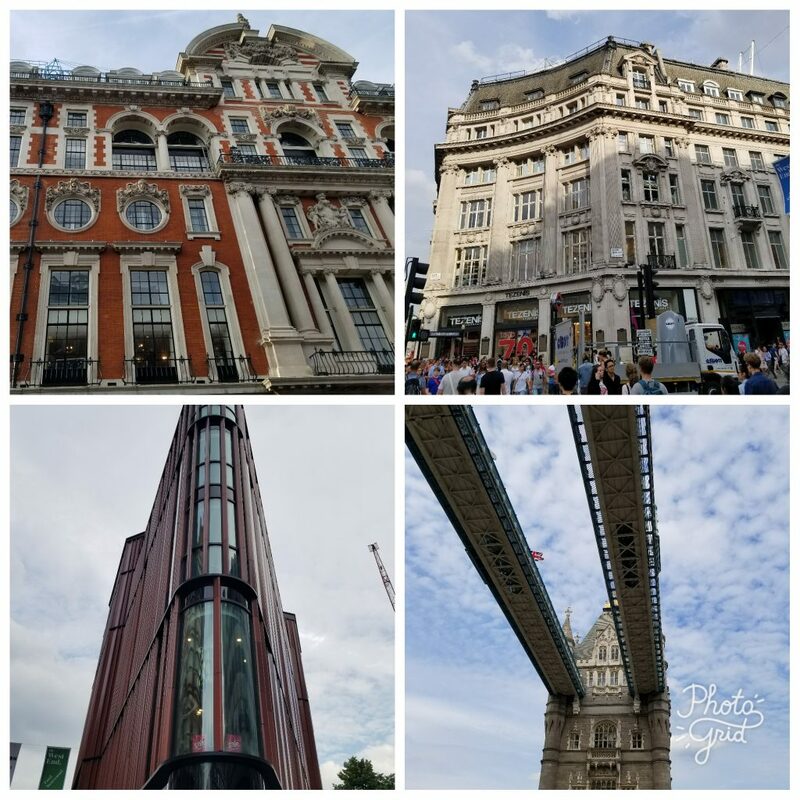 Just so you know – I followed three blogs that were instrumental in helping me decide which restaurants to go to! 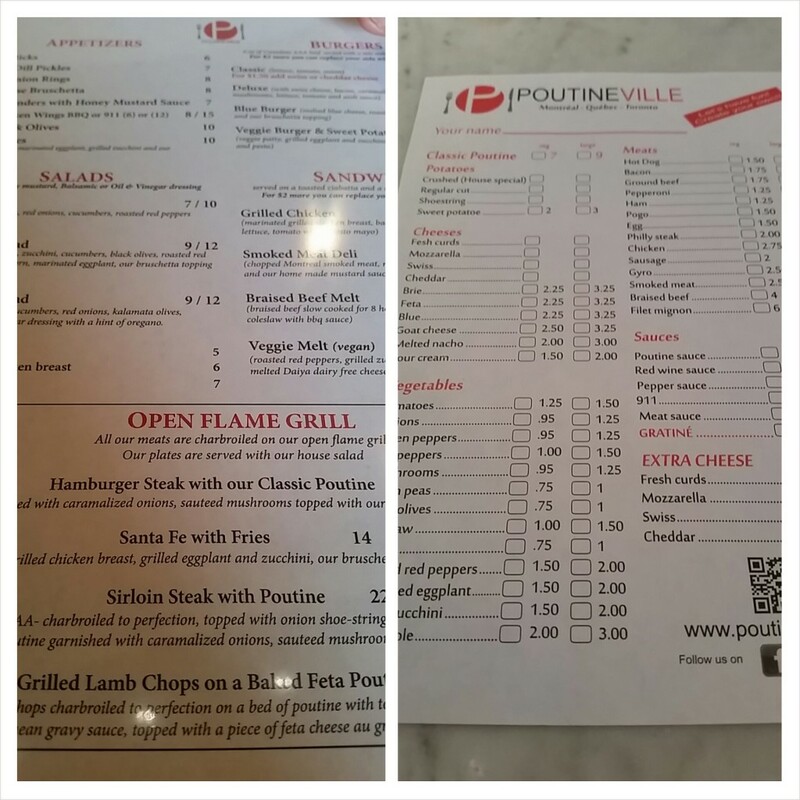 The other night I was on twitter (for a change) and I noticed a lot of buzz about @Poutineville. 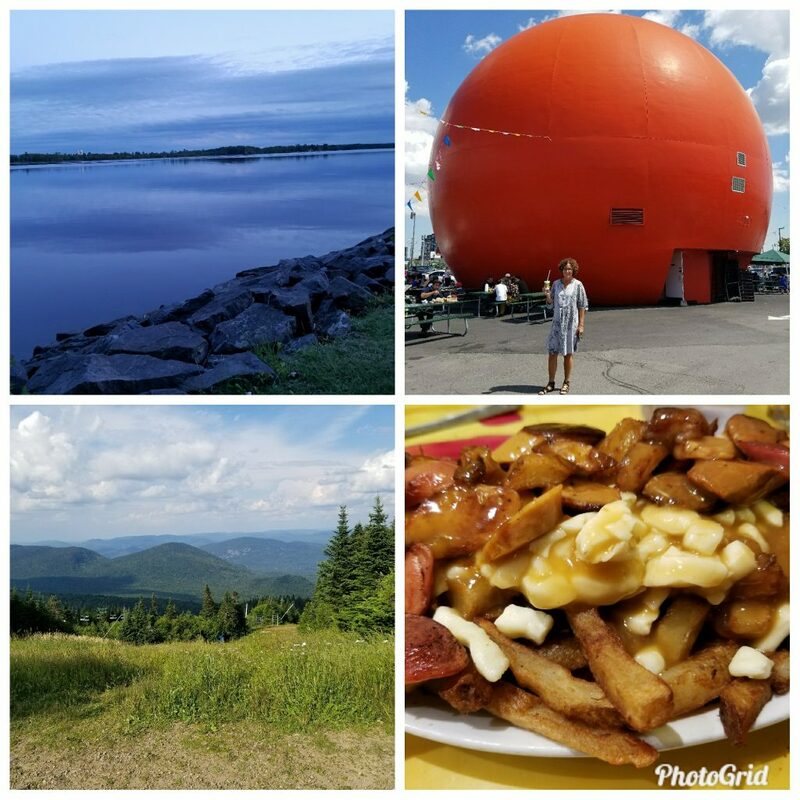 Naturally I wanted to check it out seeing as I just returned from Montreal and wanted to continue my “Poutine Crawl”!! 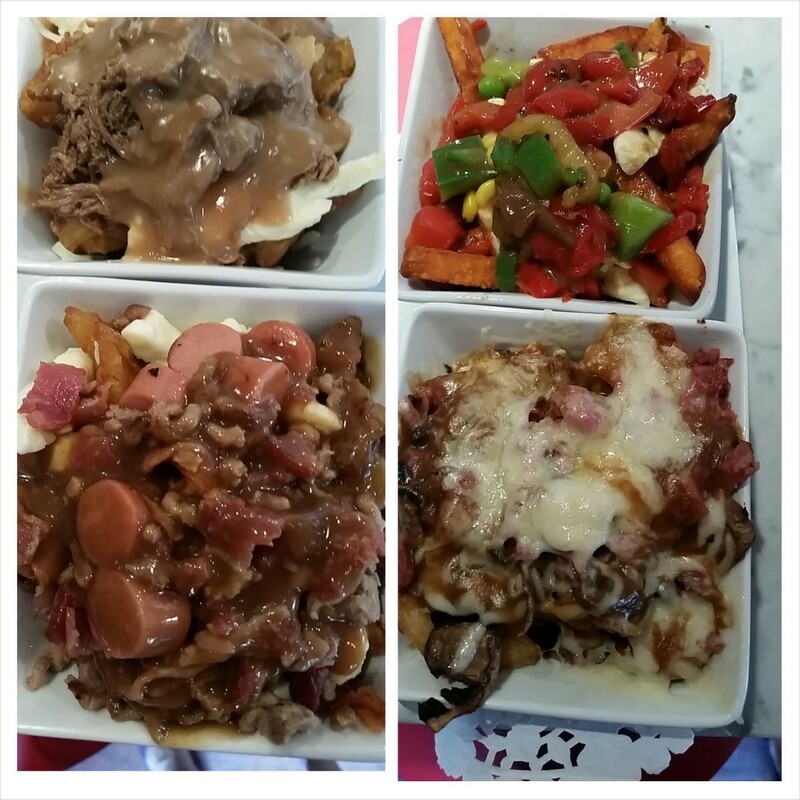 I had no idea that Poutineville has 3 locations in Montreal, cause I would have visited them on my recent visit!! However I’m thrilled to announce that they just opened in the Annex and will soon be opening a location in Quebec City too! 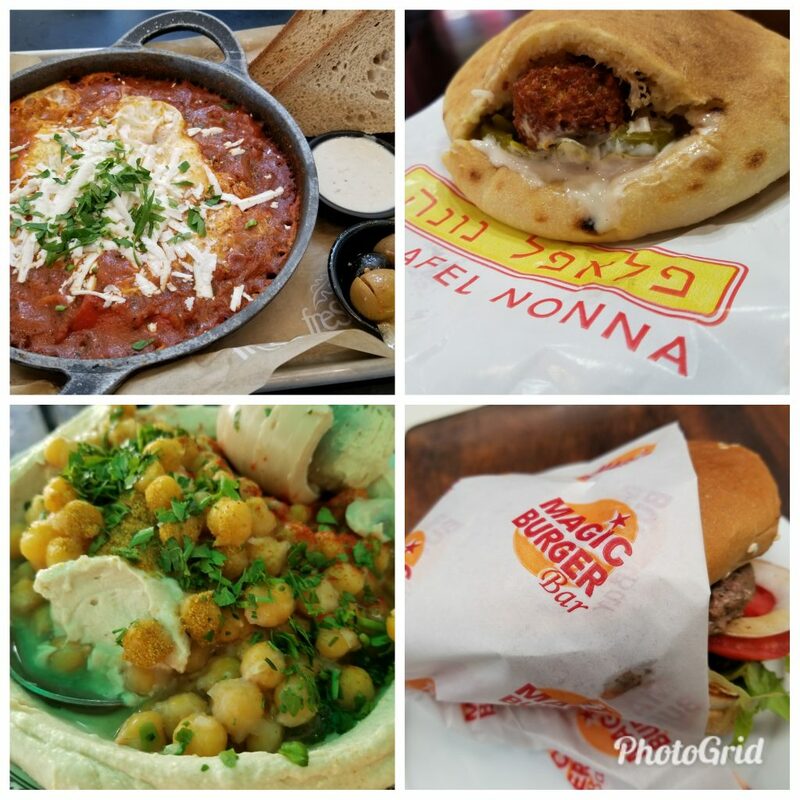 As for the menu – you get to choose the the potato (4 varieties), cheese (10 varieties), vegetable (13 varieties) meat (14 varieties), and your sauce (6 varieties)! EVERYONE WILL BE HAPPY!! There’s even an option to select ” all-you-can-eat”. 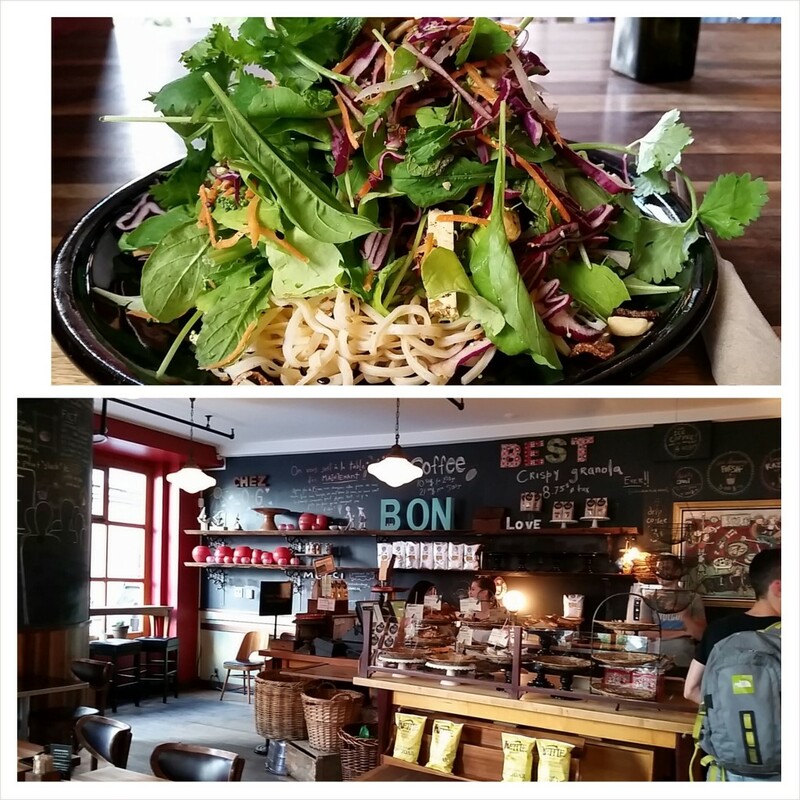 And if you are looking for a salad – they have a few varieties on the menu as well. Trust me – there’s something for everyone! I am well aware that poutine is not the prettiest dish to photograph so please excuse the less-than-glamourous-photos. But trust me they all tasted fantastic…each and every combo! 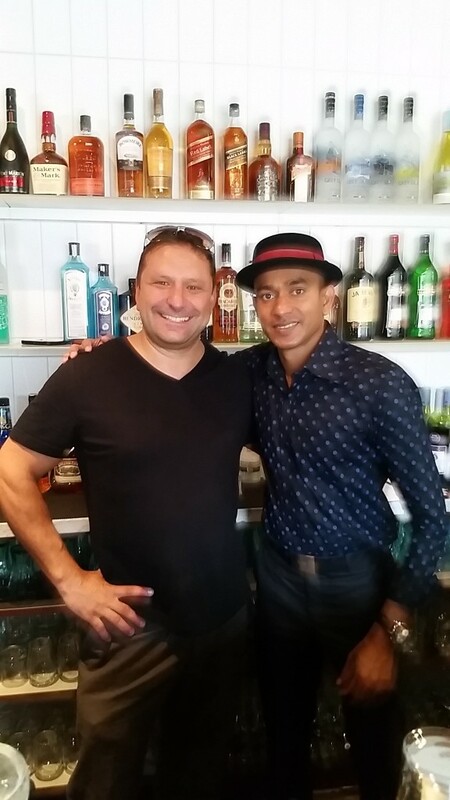 Wishing Costa (on the left) and his staff all the very best in Toronto! PS I have a friend visiting from California next week and think this would be a fun place to visit with an out of towner! Oh how I love introducing friends to the novel restaurants here in Toronto! Disclosure: I was compensated for my meal however all my opinions are my own. 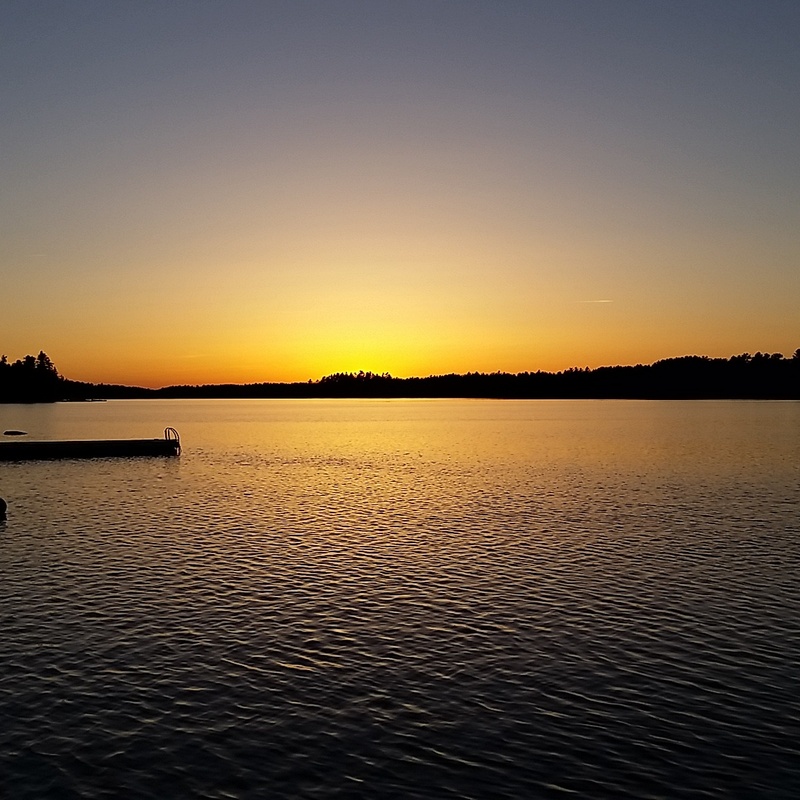 I hope this blog post finds you well and enjoying your summer. I’ve had a SUPER busy sumer. In fact it’s been so busy that I haven’t blogged for an entire month. 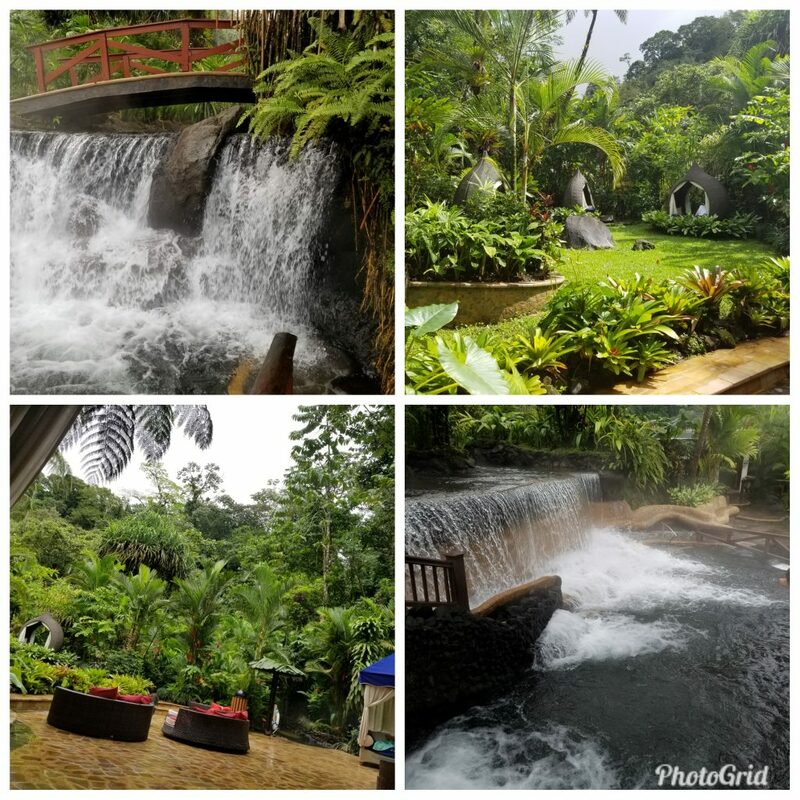 This is the first time I’ve taken a “blogging break” since 2009….when I first started to blog. a) I went to my boyfriends’ cottage from July 12 to July 27 and for some reason Rogers (my internet provider) doesn’t work up there. A neighbour suggested that I buy a Bell pay-as-you-go-package and indeed it worked. YAY. I used it to work and occasionally update facebook and to reply to emails. However I have to admit – I just wanted to sit on the dock and do NOTHING (which is what I did). c) I went to a family reunion in Ottawa from Aug 1-3. This meant I had ZERO time to blog. All we did was TALK and EAT. Repeat. 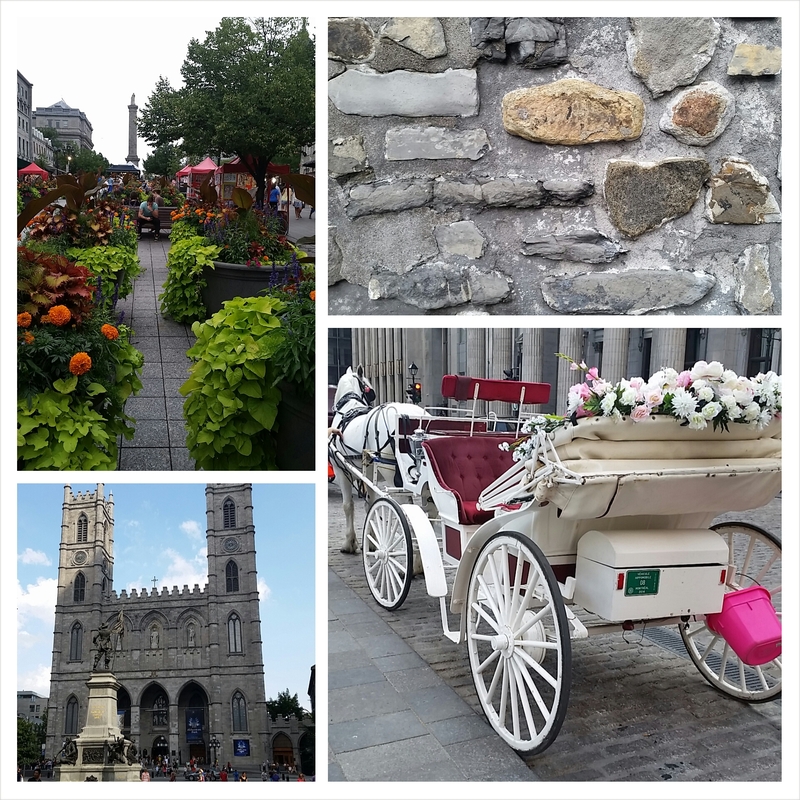 d) I also went to Montreal from Aug 3 to 13. See what I mean? I’ve been BUSY. I’ve never spent so much time in Montreal and can’t stop snapping photos ..this city is SO beautiful. (stay tuned for several blog posts..LOL). I look forward to sharing lots of summer adventures with you – starting NOW. It feels good to be back on track blogging again. I’m not sure how many events I have attended this year but let’s just say I go to A LOT of events. I’m not complaining. Infact, I’m grateful to the many people who have reached out to me over the last few years. Here’s a recap of some of my fav events of 2013. 1. Back in April I was invited to a pretty exclusive event at Tim Hortons. The event introduced their thick cut hickory smoked bacon and included a sensory expert who discussed the physiology of taste. 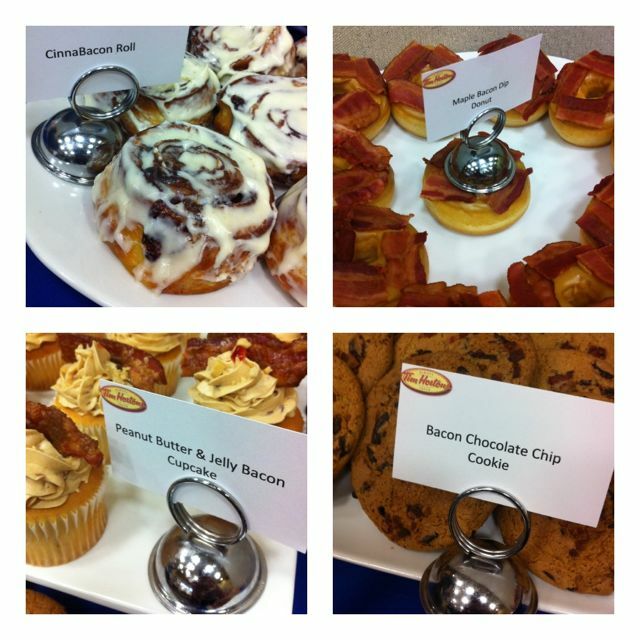 We also had the opportunity to taste dozens of delicious (um, really delicious) items that included bacon. I was in heaven. Period. 2. 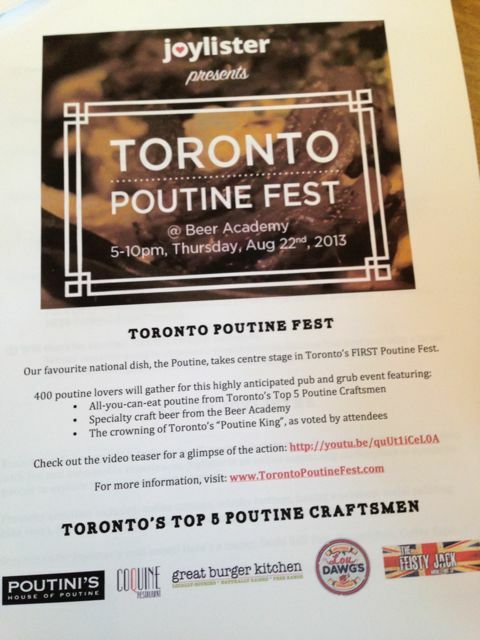 I LOVED the Poutine Festival that was put on by Joylister. I mean it – LOVED. Can’t wait to attend their Grilled Cheese Event in 2014. 3. The White Cashmere Collection Fashion Show was also pretty spectacular. It’s not everyday that I go to a fashion show like this one. The show feature 20 top Canadian designers that created stunning garments and accessories crafted entirely with pure, soft and luxurious Cashmere Bathroom Tissue. 4. Seeing as I take a TON of photos, I was delighted to have been invited to the HP Original You event. This printer is meant for me. 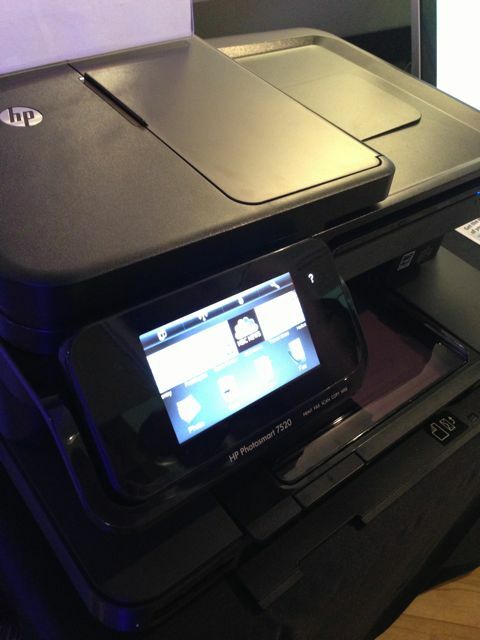 Now I can print photos directly from my iPhone in the comfort of my own home. Not to mention, create postcards, cards and MORE! 5. 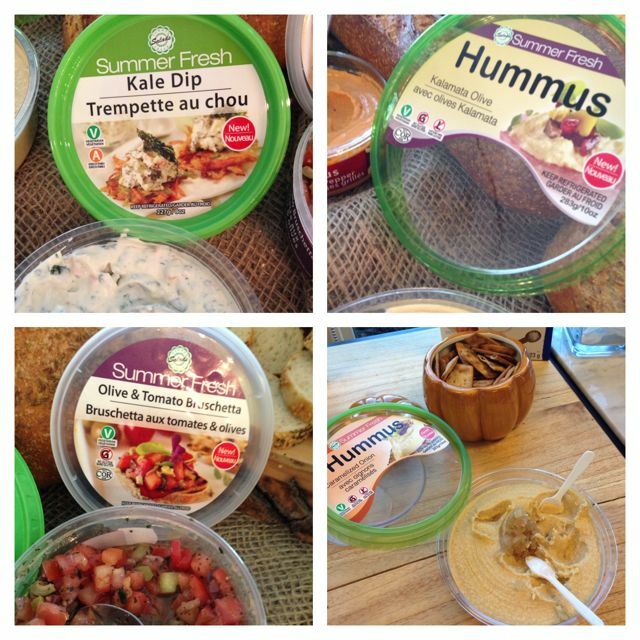 The bloggers event at Summer Fresh was informative and tasty too. 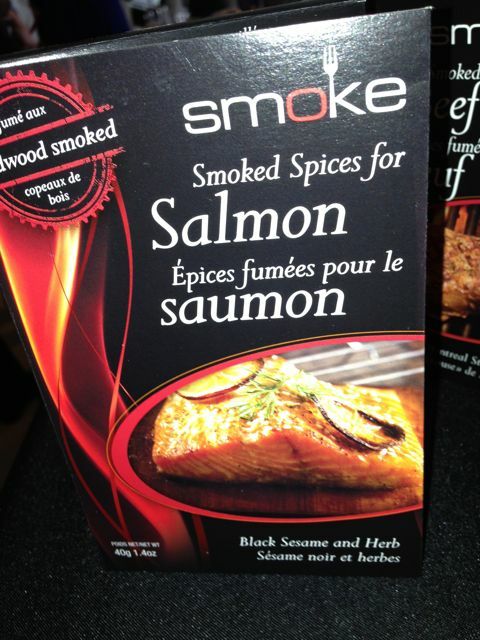 We toured the plant (which was fascinating) and had the chance to try some of their newly launched products. What a well done event in many respects. They thought of everything. 6. Metro launched their Metro App at TIFF and guess who was invited? Not only was I treated to a screening but I also had the chance to attend a terrific party on the ROOFTOP of the Thompson Hotel. What a treat. 7. 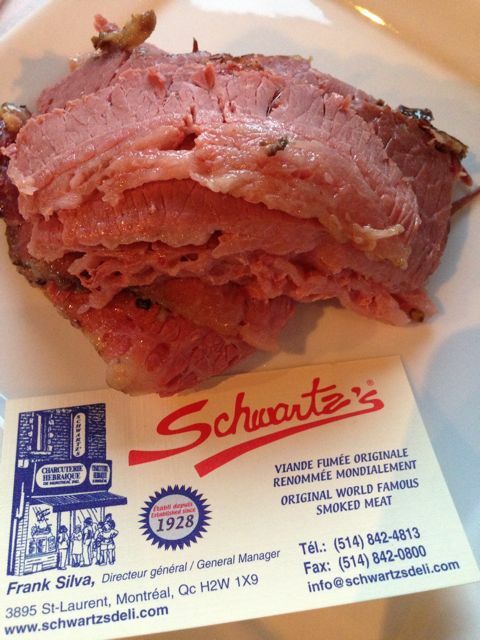 The Montreal Tourism event which included Schwartz’ssmoked meat…was nothing but brilliant. 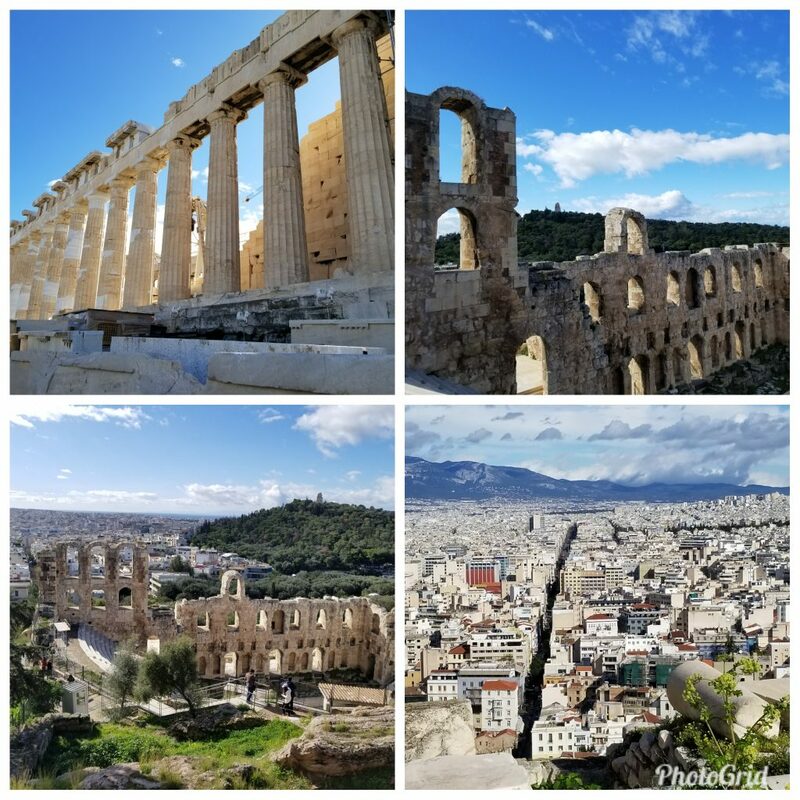 I really need to visit this spectacular city more often. 8. 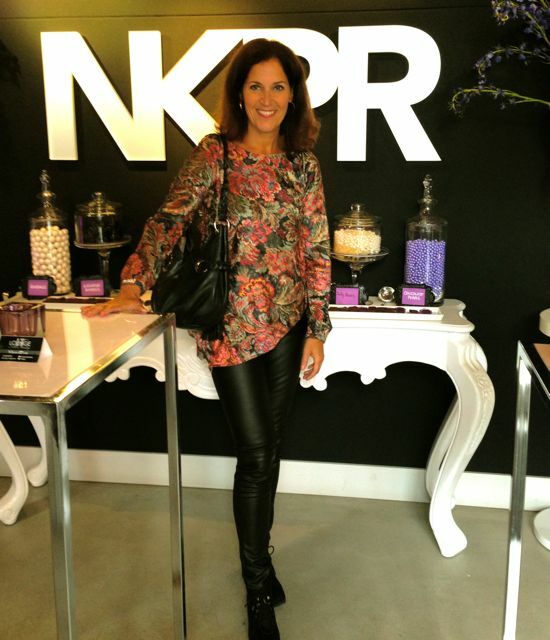 The Food Media Day at NKPR IT Lounge during TIFF was so much FUN. This event included tasty treats from: Barilla Pasta, Mideastro Restaurant, Cold Stone Creamery, SKYY Vodka, BottleGreen and AQUAHYDRATE. 9. Meeting Jessica Alba was pretty cool too. I was super impressed to learn about her commitment to the environmental and her product line called Honest. 2013 was a great year for momwhoruns and I have a feeling 2014 will be another amazing year. Happy New Years! Wishing everyone a spectacular 2014. Remember I mentioned that I went to three food shows in one week? Well, Rendez -Vous Quebec was the last one. This is a much smaller show than Grocery Innovations or CHFA but that’s just fine with me (and my waistline). 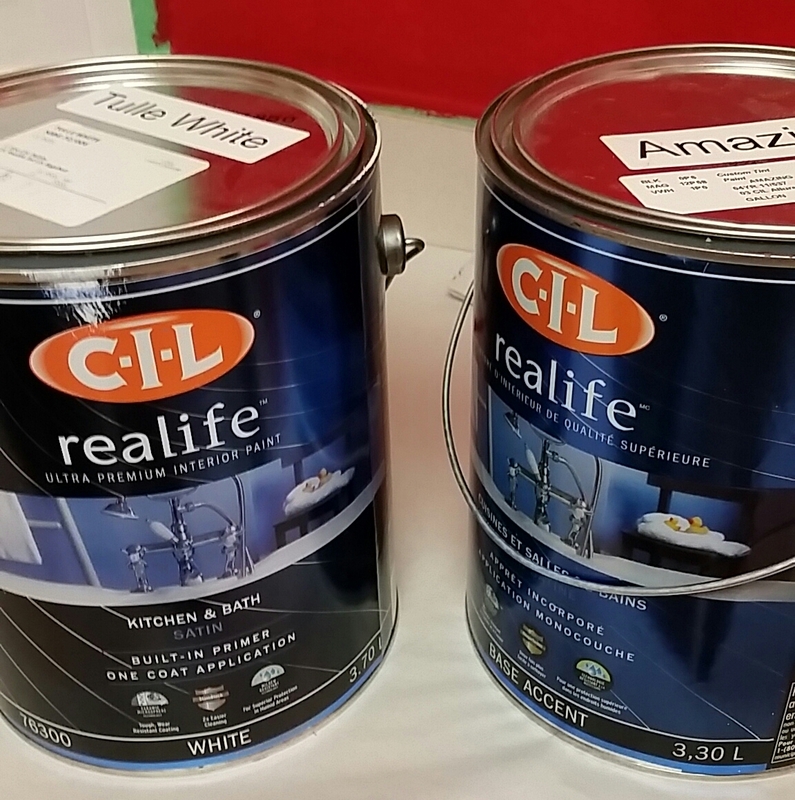 I’m sure this won’t surprise you, but I discovered a few interesting products at this show. 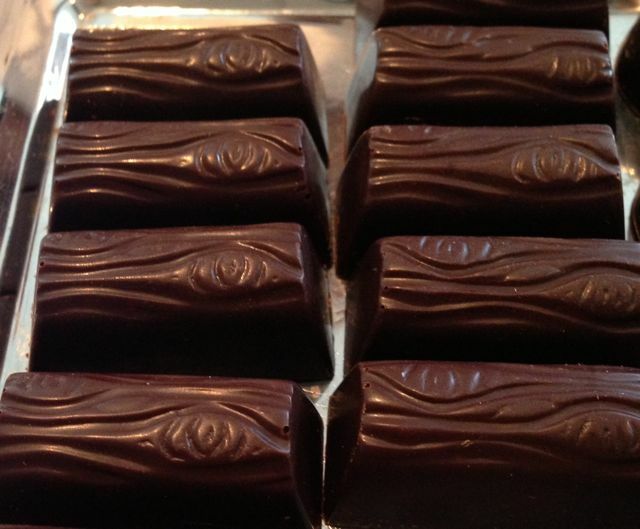 In particular…these chocolates. These were NOT just your average chocolates. You want to know what they were filled with? Not what you were expecting!! Ready? 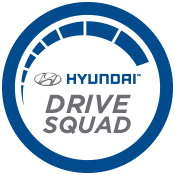 (drum roll). ….Foie Gras!! Yes. ..Foie Gras oozed into your mouth when you bit into one of these logs. Seriously. Delicious. 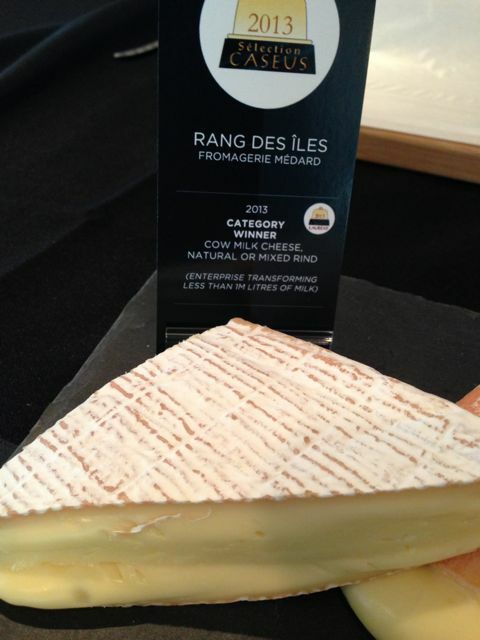 I also enjoyed some amazing Quebec cheese. There is certainly no shortage of cheese makers in this province. 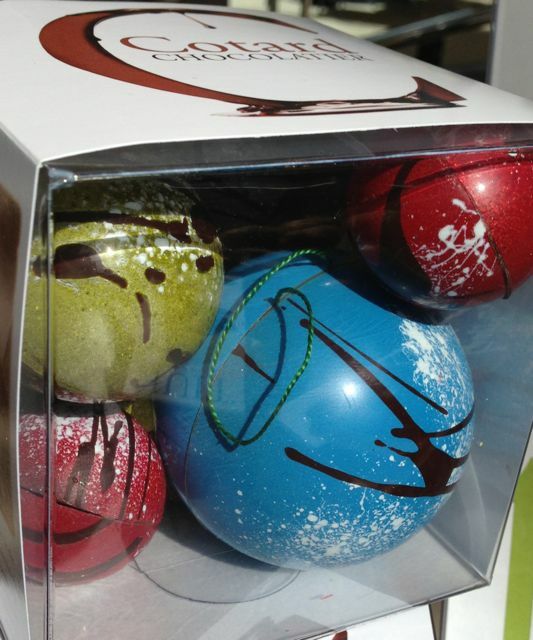 One last item that caught my attention were these gorgeous looking Christmas ornaments that were made out of CHOCOLATE. Stunning. I left the show with the feeling that I need to visit Montreal sooner than later. This province really does produce some serious chocolate, beer, maple syrup, cheese, dairy products, bread and more!! I’ve blogged about my love for Jean Talon Market and Atwater Market before and I know I will be blogging about it again in the near future. Many thanks to Bureau du Quebec for inviting me to Rendez -Vous Quebec! !